Your emails can either be saved on the email server (which takes up disk space) or downloaded by a POP3 e-mail account for better management and storage. Email Server – Webmail - Webmail is your access interface directly to the email Mail Server. You can use the webmail interface to send and receive emails. POP3 account – Desktop or Laptop - receives emails from the Email Server to ultimately store them. POP3 email client programs include Microsoft Outlook, Outlook.com, Mozilla Thunderbird, iCloud, etc. POP3 accounts can be set to automatically delete emails off the server after they have been downloaded, or after a set number of days (to allow for IMAP Account access). 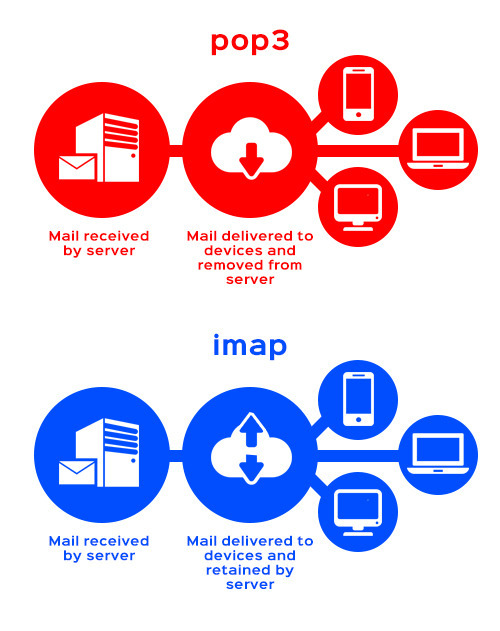 IMAP account – Smartphone, Tablet - intercepts emails before they are downloaded by the POP3 account so you can email remotely. The email message will be downloaded onto your mobile device, but it will not be deleted from the email server until the POP3 account makes the final download.